BeenThere-DoneThat: The county of Shropshire. Shrewsbury is the county town in a land of timeless landscapes, ancient churches and romantic castles which have inspired artists and writers for centuries. The delightful scenery and landscape depends for its variety and attractiveness on the rocks beneath. Shropshire is built on rocks from ten out of the twelve geological periods - the smallest place in the world to have so many. 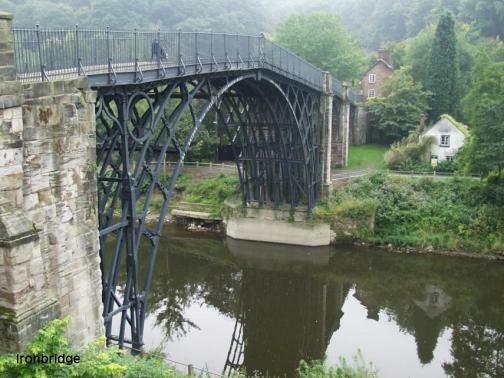 It is the home of the Industrial Revolution where, in the Ironbridge Gorge, it was discovered that iron could be smelted on a large scale as the first bridge in the world to be built of iron will testify. It also has 16 miles of steam railway. As well as the county town there are fascinating market towns such as Much Wenlock, Bridgnorth and Ludlow all of which can boast many fine historical buildings. Public Transport in Shropshire - not available on-line.